I want. I travel the world. I can stop working if I want to. Money buys me freedom," says Robert Kiyosaki. ROBERT Kiyosaki's got his and he wants to tell you how to get yours. He's written three best-selling books he says will teach you what schools don't: How to become rich. Kiyosaki's zeal to spread his message comes on strong in an interview from Phoenix, where he lives with wife Kim in their $3.5 million home. "Money doesn't matter to me," he says, and talks fervently about how to make a lot of it (understand tax laws, assets, liabilities), the definition of rich ($1 million in income annually without working) and what being rich means to him (freedom). Kiyosaki, 53, is the son of Ralph Kiyosaki, who was a teacher, state superintendent of schools in the late 1960s and an unsuccessful Republican candidate for lieutenant governor. For all his public service, high-profile positions and education, the elder Kiyosaki "died broke," the son said. 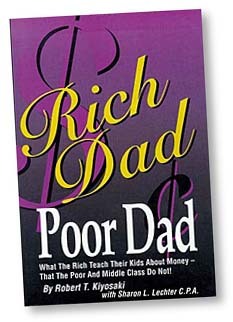 His father is the "poor dad" Kiyosaki refers to in the title of one of his books, "Rich Dad, Poor Dad: What the Rich Teach Their Kids About Money That the Poor and Middle Class Do Not," written with Sharon L. Lechter, a CPA and financial consultant. Running for lieutenant governor as a Republican was "suicidal" because of the strong Democratic Party in the islands, Kiyosaki said. When his father and his running mate lost the election to Gov. John A. Burns, "Burns blacklisted him," he said, and his father lost his job. Later, his father put his retirement money into a franchise operation. "He got one of those 'you-cannot-fail' franchises and lost all his money," Kiyosaki said, laughing at the irony. The other trait that kept his father from riches was his attitude, he said. "He used to say 'I'll never be rich,' " and that became a self-fulfilling prophecy, he said. "If you read my book, 'Rich Dad Poor Dad,' you'll see that what causes people to be rich or poor is their vocabulary, what they say," Kiyosaki said. Meanwhile, the "rich dad," an under-educated man who was the father of a close friend, taught him about money and financial matters, Kiyosaki said. Who this man is he won't say. "I have an agreement with the family that I won't disclose who he is ... but it's a true story. In the book, he asked that I say he said he died, but he's still alive." Kiyosaki also won't say how much he is worth or in what he's invested. "I own companies. I'm a major shareholder in oil and mining companies, plus real estate companies. I have intellectual property companies," he said. "I keep my holdings private. You know why that is? Lawsuits. If you have money you get sued," he said. Anyway, the rich dad's identity, the names of the companies -- all of that is beside the point. What matters is Kiyosaki's mission, which he said is to teach people, just like his poor dad did. Only instead of the three Rs, he wants to teach them how to make money. And people are interested. The book made the New York Times best-seller list and is No. 7 on Publishers Weekly's list of trade publications. "Money is a life skill," he said. "If you read my book you'll see. Money is a science, an art. But it's not taught in school. We are only told to go to school, get a job and go work for the rich," he said. "I didn't want to do that." Instead, Kiyosaki started his own businesses, merchandising and promoting musicians. Then the businesses "crashed," he said tersely. "My wife and I were homeless in 1985. I know what it feels like to be a million dollars down." He has since recovered. "I went out and got financial education," he said. Now he wants to share by selling his books, board games, videos and audio tapes through his company, Cashflow Technologies. He said he also has set up the Foundation for Financial Literacy, which uses some of the money from sales to fund talks he gives to "poor people," such as Maoris. "The Maori people, they are like the Hawaiian people. All they do when they graduate from school is become public servants. I went there to teach them how to make money with money," he said. Being rich, he said, is liberating. "I'm free to do exactly what I want, when I want, where I want. I travel the world. I can stop working if I want to. Money buys me freedom." Being rich, he said, doesn't mean you devote your life only to making money. "Why can't you do what you want and have all the money you want?" he said. "Why does it have to be one or the other? That's my poor dad -- he did what he loved, but he said he can never have money. I'm a teacher just like him. The only difference is that I make millions of dollars and he didn't." Kiyosaki seemed annoyed by the suggestion that he is making money simply by telling others how he did it. "A lot of people are interested in doing it. That's why 'Who Wants to Be a Millionaire' is one of the most popular shows," he said. "I think the reason my books are doing well is because people are hungry for financial education today. The people I have the biggest problems from often times are like my poor dad who are well educated but don't really understand how the capitalists make their money. "Read my book. I'm more a socialist than a capitalist, but I'd rather be a rich capitalist than a poor socialist. I have more power to influence so I'm actually doing more good by educating people," he said. 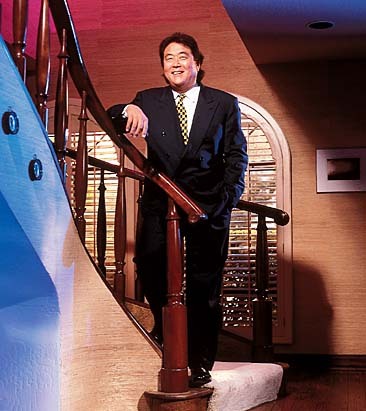 "The rich don't play by the same rules," Kiyosaki said. "Look at John Kennedy Jr. -- when he died, they estimated he's leaving to his sister's kids $300 million each. What did my old man give me? A handshake -- not that I needed it." He is not being disrespectful of his father. "Money is money, love is love," he said. "Most people are afraid that money is evil, they'll become corrupt, they'll lose their values," Kiyosaki said. "Money does not make you who you are. Money just reveals who you are. If you're a greedy person, more money makes you more greedy. If you're an unhappy person, more money makes you more unhappy. If you're a fool, more money makes you more foolish. If you're generous, more money makes you more generous," he said. "The most generous people are the richest. People that are poor are the least generous." He sees his role as a service. "The more people I serve, the more rich I become. So if I serve more people, I make more money."